Board Certified in Family Medicine and Sports Medicine. 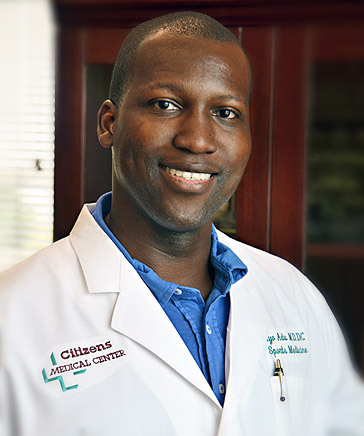 Dr. Adu is a primary care sports medicine specialist with expertise in sports injuries, musculoskeletal problems, and sports chiropractic care. He is proficient in sports concussion management and procedures including epidural steroid injections, facet injections, and fluoroscopically-guided joint injections. He completed his Sports Medicine Fellowship at the University of Oklahoma College of Medicine in Tulsa, Oklahoma, where he also completed his Family Medicine Internship and Residency training. He was named Intern of the Year and subsequently served as Chief Resident. Dr. Adu received his medical degree from Ross University School of Medicine, his chiropractic degree from Parker College of Chiropractic, and his Bachelor of Science degree from the University of Toronto.